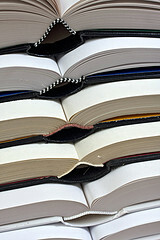 Adopting an open textbook shouldn't be hard. A lot of students still want printed books. We scour the Internet for the best quality textbooks issued under open licenses that allow for printing. Instead of finding a list of 500+ books, you'll find a short list of books we feel are really adoptable and ready to use in a college classroom. In our catalog, you'll find a description of the book, the table contents, and a list of any supplements available for the book. You'll also find information on license and file formats, and a rating from our editors. If you like the sound of the book, you can visit the book's webpage, view the book online, or order a copy from one of our print partners. OpenTextBookStore was created by educators frustrated with the time involved in finding adoptable open textbooks, with the hope to make open textbook adoption easier for other faculty. Just to be clear, we are not a publisher. This is just a listing site for publicly available open textbooks, maintained by a teacher. Print copies are made available through third party print-on-demand companies. Many of the courses have course packages available through MyOpenMath.com, which provides free online homework for several open math textbooks. In most cases, the license does require that the original author receive atribution for the work. Some licenses add additional restrictions. OpenTextBookStore only lists books for which the original license allows for commercial use, or for which the author has listed their open textbook on one of our print partners.